Is this your copy of the infohep news bulletin? Viral hepatitis leads to around 1.3 million deaths a year, approximately 257 million people are living with hepatitis B virus (HBV) and 71 million with hepatitis C virus (HCV). Viral hepatitis is one of the leading causes of infectious disease and in 2016 the World Health Organization set targets for elimination of viral hepatitis by 2030, including a 65% reduction in mortality and a 90% reduction in new infections. The Lancet Gastroenterology & Hepatology Commission on Accelerating the Elimination of Viral Hepatitis brought together experts from all continents to look at how progress towards the elimination targets could be supported and speeded up. The Commission published its recommendations earlier this month in the journal The Lancet Gastroenterology & Hepatology. The need to scale up testing and ensure access to affordable diagnostics. The need for a shift from an individualised to a public health approach to treatment and care; treatment needs to be simplified and decentralised in the same way that HIV treatment has been successfully simplified and scaled up. Sustaining and expanding adult & birth-dose vaccination against hepatitis B. The need to scale up and sustain harm reduction services and deliver testing and treatment for people who inject drugs. Identifying and mobilising sources of funding to support diagnosis and treatment in lower-income countries. National plans for elimination of viral hepatitis are needed, together with a stronger role for civil society in monitoring progress and developing policy. A greater focus on promoting universal coverage of childhood vaccines (including HBV) at international and national levels, including international procurement and funding of birth-dose vaccination. Promotion of expanded harm reduction services and decriminalisation of drug use and engagement with drug services by people who inject drugs. Greater provision of health services in prisons that include testing and treatment for viral hepatitis. Improve infection control, reduce the use of medical injections, promote the use of single-use needles and syringes and improve the screening of blood donation. Improved access to diagnostics for viral hepatitis and reduced reliance on diagnostics by use of pangenotypic regimens for HCV treatment. Develop point-of-care tests, including dried blood spot sampling, for screening and treatment monitoring. Development of national screening and patient-centred treatment programmes based on sound epidemiological data. Develop local capacity, evidence, and guidance to inform scale up of services and simplified protocols suitable for task sharing. Engage healthcare workers, civil society, and governments by raising awareness and education and reduce discrimination. Consider compulsory licensing for hepatitis medicines for countries that cannot otherwise access generics to achieve affordable prices, and ensure access policies that meet the needs of low-income and middle-income countries. Develop the investment case for eliminating viral hepatitis and develop innovative financing mechanisms to help low-income, high-burden countries achieve their elimination goals. Expanding hepatitis C screening to diagnose 90% of people by 2030, providing treatment to everyone with hepatitis C, scaling up harm reduction and improving blood and medical safety would avert over 15 million new hepatitis C virus (HCV) infections by 2030 and reduce deaths caused by HCV by 61% compared to 2015, a modelling study carried out by Imperial College, London, shows. The study is published this week in The Lancet. The modelling exercise was designed to test if the World Health Organization (WHO) elimination targets are achievable by 2030 and what would be required to achieve the reductions in incidence and mortality. Expansion of blood safety and infection control sufficient to reduce the risk of infection by 80% by 2020. Expansion of harm reduction to 40% of people who inject drugs (PWID), sufficient to reduce the risk of infection by 75% in PWID by 2020. Offer of direct-acting antivirals (DAAs) at diagnosis for all. The model estimates that 69 million people were living with HCV in 2015. If treatment and prevention continue at 2015 levels, the number of people living with HCV will be only marginally lower in 2050 (58 million). Adding expanded access to needle and syringe programmes and opioid substitution for 40% of PWID to improved blood safety would reduce new infections by a further 7%. In total, these two prevention interventions would avert 14.1 million new infections by 2030. But to achieve this outcome, 51.8 million people would need to be started on DAA treatment by 2030. The WHO target for reducing mortality would be narrowly missed in 2030 if the comprehensive package of all interventions was implemented but would be achieved by 2032. The WHO target for reducing new infections would be achieved by 2030.
WHO estimates that it would cost US$11.9 billion to implement its strategy for elimination between 2016 and 2021. Another study on liver cancer and HIV published this month has shown that people living with HIV have significantly poorer survival times after diagnosis with liver cancer (hepatocellular carcinoma). An international cohort study of people living with HIV diagnosed with liver cancer between 1996 and 2016 found that HIV infection increased the risk of death from liver cancer by approximately 25%. People living with HIV diagnosed with liver cancer survived a median of 2.2 months after diagnosis compared to 4.1 months for HIV-negative individuals. The stage of HIV disease did not appear to affect survival after liver cancer diagnosis and co-infection with hepatitis C was not a risk factor for death after liver cancer diagnosis. Why people with HIV should have poorer survival after liver cancer diagnosis is unclear; the study of end-stage liver disease in co-infected people found that people with HIV tended to be diagnosed with more aggressive tumours, suggesting that HIV may upregulate tumour activity even when the virus is fully suppressed on effective treatment. Conditional cash transfers – giving money to encourage use of services – may be needed to reach drug users for hepatitis C testing and treatment if they are either unaware of hepatitis C or do not see it as a risk or a priority, French researchers argue in the Harm Reduction Journal. 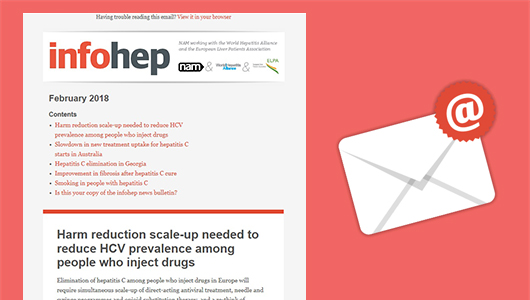 As the result of a respondent-driven sampling originally designed to improve services for people who use drugs in the Strasbourg region of France, the researchers concluded that efforts to achieve universal screening and treatment of drug users for hepatitis C virus (HCV) are destined to fail without the use of conditional cash transfers to encourage engagement with services that provided testing and treatment for HCV. Conditional cash transfers have been used extensively as incentives to encourage health-seeking behaviours or educational attendance, as well as poverty reduction. There is little research on their use in the field of viral hepatitis except as incentives to encourage hepatitis B vaccination. The respondent-driven sampling study found low rates of HCV screening among people who had dropped out of drug treatment or never attended a specialised drugs service. Eighty-two per cent of those who had not been screened for hepatitis C said that they were not concerned about the risk of acquiring hepatitis C and only 30% said they knew of the efficacy of hepatitis C treatment. Hepatitis C ranked far below obtaining paid work, stable housing and dental care as a priority for all respondents and when asked to rank their future priorities, it was almost at the bottom of the list for people who did not know their HCV status. The researchers say that their proposal should be tested in a study to see whether conditional cash transfers and the respondent-driven sampling method lead to improvements in screening and treatment among drug users. Despite access to hepatitis C treatment, many people who inject drugs still perceive numerous barriers to starting treatment, including the attitudes of healthcare workers, the difficulty of juggling treatment with competing demands, a lack of support to navigate the healthcare system and problems with blood tests due to damaged veins, an Australian study published in PLOS One reports. Long-term injectors with many damaged veins saw difficulties in undergoing a course of treatment that might entail numerous blood samples. “The big barrier for me is that no one can get blood out of me, I’ve just got no veins and I mean this has been problem for the last 10 or so years,” said a 64-year-old woman. For some, the numerous competing demands of managing opioid substitution therapy, co-morbid conditions, childcare and mental health conditions made it difficult to access direct-acting antiviral (DAA) treatment or to travel to healthcare facilities where it was available. Intermediary services that can help to connect people to treatment – for example, by providing transport – are needed, the study investigators recommend. Finding non-stigmatising and accepting healthcare workers also represented a barrier to care. Interviewees agreed that information on where to access non-stigmatising services that provide DAA treatment would encourage people to seek treatment. Tenofovir alafenamide (TAF; Vemlidy), the new formulation of tenofovir, continues to appear at least equally effective for treatment of hepatitis B but with a better safety profile than the older tenofovir disoproxil fumarate (TDF; Viread), according to a presentation at the recent AASLD Liver Meeting in San Francisco. The study found that one year after people switched to TAF, bone mineral density had improved significantly. People who switched to TAF were less likely to experience worsening kidney function. TAF, like other treatments for hepatitis B, reduces levels of the virus but does not cure the infection in the vast majority of people. A challenge to NHS England’s procurement exercise by the pharmaceutical company AbbVie has been dismissed by the High Court. AbbVie had challenged several aspects of the procurement process that they saw as giving an unfair advantage to other companies. The High Court decision will allow a comprehensive elimination programme to go ahead. NHS England will spend £190 million a year for up to five years on direct-acting antivirals. Pharmaceutical companies, in addition to supplying drugs, will also support case finding and diagnosis to maximise the number of people treated. Although the precise details of costs and market share are confidential, a report on the legal case by The Lancet contains useful detail on the way in which the procurement exercise was organised to maximise numbers treated. Companies were asked to bid against each other to treat three segments of the patient population, including patients with decompensated cirrhosis. The procurement exercise was also designed to maximise competition between the three companies manufacturing direct-acting antivirals to obtain the best prices. More information on how tendering exercises of this sort operate would assist in advocating for procurement practices that maximise the numbers treated for hepatitis C virus within available budgets. Is this your copy of the infohep news bulletin, or did you receive it from a friend or colleague, or find it online? You can sign up to receive this monthly email bulletin, free of charge, on our website, where you can also find an archive of all the infohep news bulletins. Connect with infohep on Facebook: Keep up to date with all the latest news and developments. Follow infohep on Twitter for links to news stories and updates from infohep.org. Follow us at www.twitter.com/infohep. Follow all the infohep news by subscribing to our RSS feeds. We are grateful to Abbvie, Bristol-Myers Squibb, Gilead and Janssen for funding infohep.org. Our funders have had no editorial control over the site’s content.